Do you ever marvel at how flying connects things? Altitude brings life to the notion of “six degrees of separation.” From high over the Arkansas hills, for example, a person can see Friley Creek flowing into the Little Mulberry River, which flows into the Big Mulberry, followed by the Arkansas River, the Mississippi, and finally the Gulf—where perhaps Kevin Bacon is vacationing. Somehow the world changes when we fly over it. Slap on a pair of flying goggles and distances between places become small. Even familiar stomping grounds are not safe from the effects of altitude. One of my most eye-opening experiences took place a few years ago during autumn in the Ozarks. I took off from Byrd’s Adventure Center on the banks of the Mulberry River and flew half an hour to the valley of Clear Creek to meet a friend and fellow aviator, Dr. J.P. Bell. Always cheerful, J.P. is a respected Fort Smith physician and a first-rate photographer with a passion for trains and aircraft. He grew up along the banks of Clear Creek. The plan was to fly together in my trike, which J.P. is fond of for photography reasons, and follow old Frisco railroad tracks near the hamlet of Rudy. Our goal was to get shots of the famed Arkansas & Missouri passenger train making its fall trip along Clear Creek. We also hoped to study J.P.’s creek-side hayfield as a possible landing strip for future adventures. As I made my way toward the valley a realization took hold: Clear Creek was like a long-forgotten friend. When I was a kid my family visited this stream at a place called Lancaster Landing to cool off during summer months. Traveling regularly to escape the swelter of Fort Smith, the drive involved beating down a rough dirt road that seemed endless. But once the dust settled there was no more gorgeous spot to hike, swim, fish, and catch crawdads. It was also a great spot to acquire poison ivy, become tangled in spider webs, and—most memorably—encounter snakes. Incidentally, running from snakes seems instinctive among children and most adults in this part of the world. I propose an International Symbol for Snakes be chartered to advise visitors. Following better-known international symbols, it would feature a person running with arms flailing overhead. This works equally to advise for bees and spiders. Anyway, as I flew along Clear Creek many fond memories came back. J.P. was waiting on the edge of the meadow at Rudy when I set up my landing approach. The morning fog had delayed departure from the Mulberry Valley, so now we were running short on time. The train we were hoping to locate must have been between the Winslow tunnel and Mountainburg by the time my wheels touched down on the grass. Camera in hand, J.P. strapped into the trike’s backseat and hollered, “Let’s go!” Moments later we were off into the autumn blue. From Rudy, we flew north along riverside rails dating back to the 1880s. Although miles from the swimming hole mentioned earlier, Rudy was another place of forgotten significance along this valley. My grandfather used to take me to the old basketball gym next to the town’s dilapidated schoolhouse. I found myself barnstorming over the wood-floored structure where I learned to ride a bicycle at age five. It was the spot where Grandpa attempted to teach free-throws and bows and arrows to a hopeless grandson, trying to pass along what he had done with accolades during his Arkansas Razorback years. (Sorry, Grandpa!) It was the site of my first dirt bike crash and my first preteen crush—a freckled girl across the lane. I couldn’t believe how different this landmark looked from the air. J.P. and I arrived over his hayfield a few minutes into the flight. We flew over it in several directions but decided a bit of tree trimming would be necessary to create a safe landing spot. Meanwhile, a lady living across the tracks came out in her flower-print dress and waved. We waved back and J.P. snapped a few shots with autumn oaks blazing in her yard. As we continued up the creek we passed several railroad trestles and sandstone bluffs. I had last seen these decades ago from a canoe. Making our way upriver we encountered folks enjoying the creek at a wide gravel bar. It was too cold for swimming (and snakes), but they appeared to be fishing and having a good time. The people waved and J.P. snapped a few photos before we continued to the new interstate bridge. This high-flying structure was built recently and certainly has changed the landscape. Cars and 18-wheelers sped furiously across the span, while a hundred feet below trickled the serene waters of Clear Creek. We made a few passes around the bridge with J.P.’s shutter clicking away. A few miles more and we spied another forgotten spot. 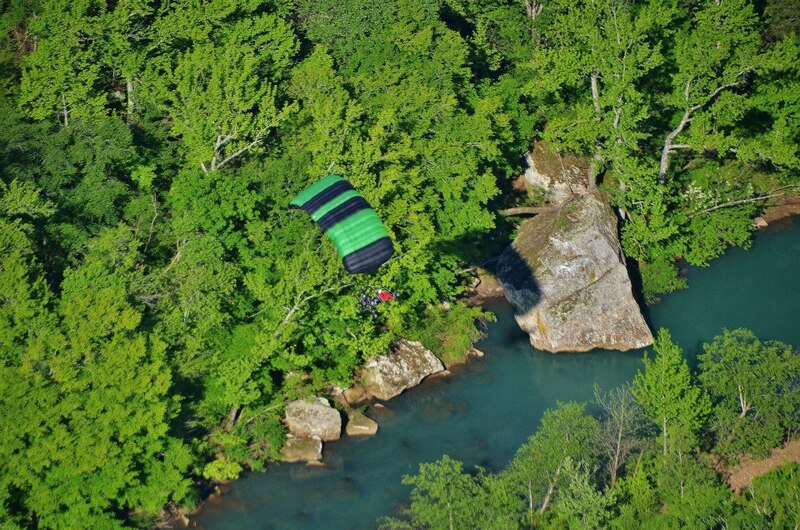 On a northwest-facing slope overlooking Clear Creek sits Secret Site, one of Arkansas’s finest hang gliding launch points. This is where many of us took our first mountain flights after training on the bunny hill. Fledgling hang glider pilots often train by ground skimming over grassy knolls, usually situated in cow pastures in the middle of nowhere. The moments aloft offer tastes of bigger flights to come. However, they also offer tastes of the slightly misnamed “landing zones.” Secret Site is perfect for mud-spattered initiates who want to gain altitude and break free from the cows. During my Fayetteville college days, Secret Site provided hours of distraction. The “jump-off spot” is carved 400 feet up the mountainside, offering spectacular thermal riding and ridge soaring for any bird or human. Here I enjoyed countless flights with long-haired hang gliding buddies and once circled tip-to-tip with a bald eagle. One talented friend pulled off a thermal-powered flight all the way to Mt. Magazine—Arkansas’s highest point, a distance of 50 miles. As J.P. and I admired the landscape where wings were earned, suddenly—without warning—there it was. The passenger train raced out of the trees into the autumn sun. It headed directly beneath us as we bumbled over Secret Site’s landing zone. J.P. yelped and pawed for his camera as I swung the trike parallel to the train. What followed may be the most exhilarating moments of my flying career. Imagine you’re on a passenger train traveling 40 miles an hour through tranquil forests and meadows. Suddenly a flying contraption swoops alongside and two odd-looking fellows smile and wave. One of them has a camera. Now picture the scene from another perspective: You’re flying along minding your business when out of nowhere a train full of autumn leaf-lookers appears. Inside you see people rushing to your side of the train. They wave enthusiastically, pulling out cameras. Time slows for an instant. Racing alongside the train, J.P. hollered photographic requests over the hum of the trike’s propeller. We swooped low over the meadows, hopping trees and fences and keeping a safe distance from the train. At times J.P. asked to run ahead and cut back to get a shot of the entourage over a rusty trestle. It was challenging getting the trike into position at just the right moment, but J.P. seemed happy. “Got it! Let’s run ahead,” he hollered. I hit the throttle and sped ahead of the train. “Drop in here!” Click. Click. We were having a blast and so were the leaf-lookers on the train. For a few minutes, the flying machine was perfectly in its element. Gaining altitude over Clear Creek’s trestles and charging over its fields, it felt like we were filming a Wild West train robbery for Hollywood. We paced with rumbling procession for six miles to the outskirts of Van Buren before waving goodbye and returning to the landing spot at Rudy. Back on the ground spirits were high, so J.P. and I hopped in his truck and drove across the tracks to Rudy’s miniature Main Street for an Andy Griffith-style celebration. We patronized the general store, which hadn’t changed since I was a kid, and topped our victory with sodas and sandwiches. The fun was short-lived, however, as J.P. had pressing afternoon engagements to attend. We agreed to fly another day and he dropped me at my waiting trike and drove away. Still hungry for airtime and lunch—the sandwich didn’t quite do the trick—an idea came to mind. I called my mother and she offered to drive over from her Fort Smith home to meet at Rudy in an hour. This allowed time for a quick solo flight to Lee Creek, another spectacular valley a few miles away. I couldn’t resist seeing one more Ozark stream in full leafy glory. An hour later Mom and I were enjoying afternoon pancakes and bacon at a 24-hour diner near Rudy. Huddled at the table and squinting into the camera’s viewfinder, we looked at pictures from the day and discussed forgotten landmarks. She was enchanted with my still-fresh aerial photos of Lee Creek flowing out of Devil’s Den State Park—a place she had spent time as a kid and, decades later, as a mom. Connections were made for us both, providing topics for tableside conversation. Flying home from Clear Creek at sunset, I chose a path over the Ozark Highlands. Somewhere between Mountainburg and Mt. Gaylor, I was caught off guard by autumn colors surrounding Lake Fort Smith. A fiery White Rock Mountain passed to the south, while a dozen never-to-be-forgotten streams poured Gulfward from their highest reaches. It was one of the most meaningful journeys I’ve had the fortune to make.